I went to a friend's birthday party at TechCity Bowl in Kirkland. 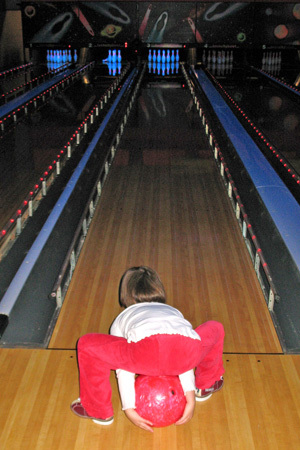 I'd never been bowling before, and I didn't know what to expect. It was dark and noisy inside, but I soon got used to that. They gave me some red and white shoes, and then I selected a red bowling ball. It was heavy! After a little while, I developed a special technique for rolling the ball down the lane [right]. Sometimes it bounced off the bumpers, but I also got a couple strikes, and I then I jumped up and down—my bowling dance! The worst part was when one of the other kids dropped his ball on my foot; that hurt a lot and I cried. But then the next time I knocked down a group of pins, I jumped up and down with excitement all over again. Easter egg dyeing is magic. 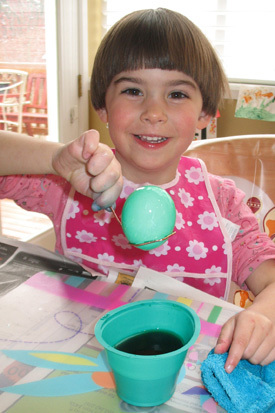 You take an egg that Mommy has boiled and use a special wire to lower it into a cup of colored water. You swish the egg around for a while and spoon color over it. Then when you take it out—voilá—the egg is a color! Mommy and I filled up a whole basket of blue, pink, yellow, orange, green, and red eggs. They were beautiful! 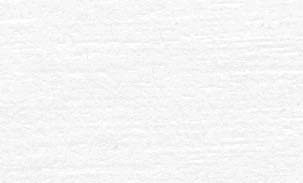 This year I counted down the days until the Easter Bunny would arrive. Sunday morning I saw that he had been here as soon as I stepped out my bedroom door. He hid 40 eggs (he told me in a note), and within a half-hour I had found 38 [right]. (I found the other two before the end of the day.) He also left me a beautiful Easter basket (Cameron, too). 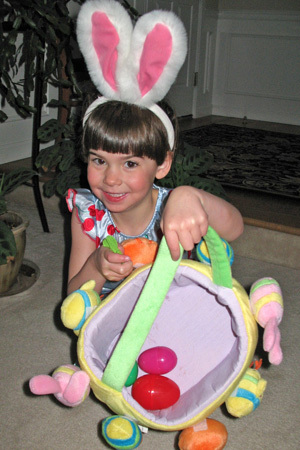 In it were a chocolate bunny, jelly beans, tulip lollipops, pink dress gloves, a pink frisbee, sidewalk chalk, and a bracelet. After a small breakfast, I dressed in my fancy Easter dress, complete with white hat, gloves, patent leather shoes, and bunny purse. Then we went to Madison House to have Easter brunch with Grandma. Guess who surprised me there? Peter Cottontail! He gave me a big hug and some some chocolate kisses from his basket. Brunch was nice, but thanking the Easter Bunny in person for all my goodies was the best part of all. 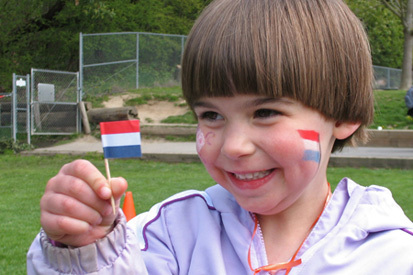 After Saturday morning Oranjeschool, the school held a Koninginnedag party for all the students. It was very fun. We played games outside—walking on stilts, kicking a soccer ball through goals, throwing a ball to knock cans down, throwing a beanbag through holes in a board, identifying objects hidden inside boxes, and pinning a tail on a cow. After each one someone stamped my game "passport." We had yummy food to eat, and I got my face painted, too [left]. My friend Luna had her birthday party at Kelsey Creek Farm. 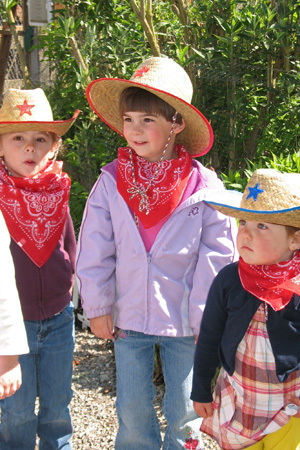 When I arrived her dad gave me a cowgirl hat and a bandana to wear [right], and then we toured the farm. We got to pet a pony, feed the hog, say hello to the cow (she's old), pat a fuzzy baby chick, and pet a black-and-white bunny. Then we went inside to sit at the crafts table, carded real sheep's wool, and made little sheep with the wool, a pinecone, and plastic wiggly eyes. Next we had hotdogs and veggies for lunch. And then we broke open a piñata! That was the best! When I grow up, I want to be a cowgirl. Then I can herd cows into the corral. 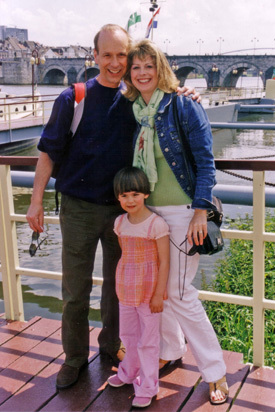 When we arrived in Düsseldorf, Tante Lianne picked us up at the airport and we drove to Venlo, The Netherlands, only about 30 minutes away. We flew there instead of Amsterdam because the next day my cousin Christel was to get married! I got all dressed up for the wedding, and it was a long, exciting day. 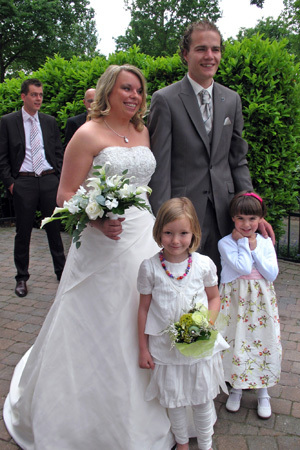 The bridegroom, Sjuul, and their flower girl, Sima, arrived at the house, and Christel came down the stairs looking as beautiful as a princess [left]. Sjuul's family came for a small reception. Later we all drove to the main square of Venlo, and Christel and Sjuul married in the stadhuis (city hall). I fell asleep half-way through the ceremony because of jet lag. Tante Annemiek, Maaike, and Jasper let me lay across their laps. Immediately after the wedding we all went outside into the square, and Christel's students (she's an elementary school teacher) were waiting for her. They formed a line for the newlyweds to walk through, and as they walked, the children let go of red balloons they were holding. The balloons floated away; it was really neat! The party was at a restaurant called Galerie de Hoeve in Venlo. Christel and Sjuul opened gifts, we ate a buffet dinner, and we had ice cream cake for dessert. Then the tables disappeared so everyone could dance. I danced until about 9:00, when Papa began to fall asleep i his chair, so it was time for us to return to Tante Lianne's. I didn't want to leave because everyone else was staying, but Mommy said that we still had lots of jet lag. We spent the next couple days staying with Oma in Vlissingen. We visited with family, took walks, and went shopping. 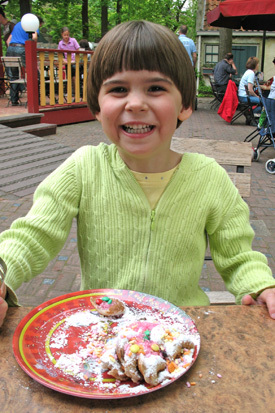 Then we did something wonderful: a day at Efteling! We went on lots of rides and saw lots of sights: PandaDroom (Panda Dream), a 3-D movie with realistic effects in the seats, like rain and wind; Volk van Laaf (Folk from Laaf), an elevated monorail ride through a land of magic little people; Carnaval Festival, a seated tram tour through dolls from around the world making music; Monsieur Cannibale, with spinning cannibal's pots; Bobbaan, a bobsled roller coaster; Gondolette boat tours; Pagode, going way up high to see the whole park from above; and Sprookjesbos, a walk through a magic forest filled with fairy tale vignettes like Hansel & Gretel, Snow White, Cinderella, Rapunzel, Rumpelstiltskin, and many more. My favorite ride was Droomvlucht (Dream Flight), a seated tram tour through a magic fairy land. For lunch I had a plate of poffertjes, miniature puffy pancakes slathered in butter and covered in powdered sugar [right]. Delicious! Papa also bought me a stick of suikerspin ("spun sugar"—cotton candy). That's my favorite. The park closed at 6:00 and we still hadn't seen everything (plus, I was too short for some rides), but it was definitely one of my best days ever! From our home base back at Tante Lianne and Oom Rob's house, the next day we drove to the city of Aachen, Germany. It was a festival day, and although the shops were closed, everyone was in the streets for speeches, music, and food. Papa had beer and Mommy and I shared a cherry-covered pancake. At an inflatable jump house for kids I asked Papa how to say, "Will you please play with me?" in German. I don't think I spoke German well enough because the kids ignored me; that made me sad. We went inside the Aachen cathedral, and outside around the old town we found lots of different fountains (I love playing in water). At the end of the afternoon we sat outside a small cafe and had ice cream sundaes. We also spent a day in the Dutch city of Maastricht. It's on the river Maas [left], where we took a boat ride. We went inside the St. Jan church, which was hosting an exhibition of Marc Chagall. I liked the paintings, and Papa also helped me light a little candle. As we were walking outside I saw a group of people surrounding a statue—and then the statue moved! When I put a euro in the statue's hat, it bowed to me and blew me a kiss! What kind of statue is that?! Mommy left from Düsseldorf the next day, while Papa and I returned to Vlissingen to stay for another ten days. I went to morning preschool at Franciscusschool in Vlissingen; it was fun to be with other kids. Papa also took me to the Arsenaal, a pirate-themed play area and aquarium, in Vlissingen; the Bambini play area; the Imkerij Poppendamme, a bee farm in Grijpskerke, where I saw lots of bees and got a bee costume; and the Sportpunt Zeeland, a big swimming complex with lots of fun slides, in Goes. We also went to Rotterdam for a day to visit with a group of Papa's friends. Papa said that our visit was a big success because my Dutch got even better. And I had a great time visiting so often with all my Dutch relatives. But even though I saw Mommy on Skype every day while we were apart, when I got off the airplane in Seattle and saw Mommy again, and was really, really glad to be home again.